Hi ONS Gamers, Tirc back for my addition to this Memorial Day Weekend Event – Memorial Racing Weekend! I had originally planned to write on an old racing game that I hadn’t played for years either Super Mario Kart or Gran Turismo 2 both of which I have spent many hours of my life on. A couple months ago I had picked up Burnout Paradise on a Humble Bundle deal for a couple bucks so I thought I would fire that up this past week in spirit of the event. I am writing this only having played a few hours of the game, so keep that in mind. The last racing game I had played prior to this was probably a Need for Speed on the PS2 so this was a great step up. For a January 2008 release I thought this game played very well for the time. I say that not having played a racing game on the PS4 or Xbox One so I’m saying so ignorantly. At max settings on my PC it is a really nice looking game. Burnout brought a new style of race that I hadn’t seen in other racing games that I have played, take downs. You have always been able to nudge a racer to try to get them to fish tail or force someone into a wall but there are usually risks associated with that in simulation games that will cause you to lose control just as often. It seems so natural in this game to put someone into the wall and then see a cut-scene of them flipping up on the guard rail. Not only can you do this in the course of a normal race but there are race types where this is the sole goal. the game feels just arcadey enough to be considered an arcade racer but the different types of cars brought with it a nice dynamic of handling. When you are in a SUV it feels like an SUV as opposed to feeling like a Lancer EVO. The method used to acquire cars is really cool as well. 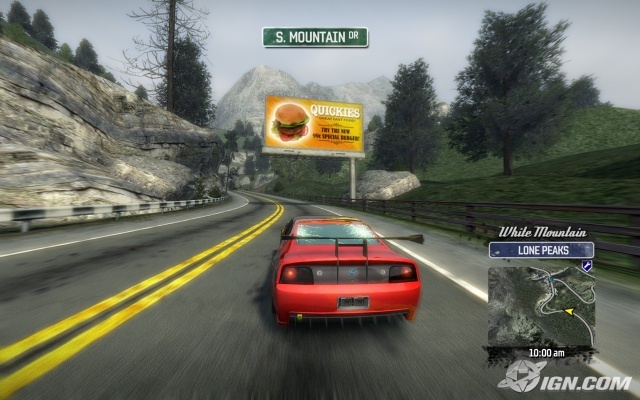 As you progress through the game the “announcer” will tell you that a new car has been spotted around Paradise City and that in order to acquire it you must take it down. So if you drive around for a minute or two you will spot the new car and then it is a solo take down mission. Once you manage to crash their car it gets dropped into your Junk Yard (your garage) for your use. Right away within the first few cars you can feel them getting more and more difficult to take down. It gives you a certain sense of accomplishment and ownership of that car after you are able to obtain it. The other difference between this game as well as some newer games as opposed to older racing games is the open world approach that it takes. It just puts you down in the middle of Paradise City and you are free to roam. You discover different shops such as repair shops and paint shops along the way which then appear on your map when you find them. This is how they handle unlocking races as well. If you come to a light and a race is available there it will show up around your mini map and also permanently mark it on the map as well. You just need to push the gas and brake at the same time and it will start the race. There are many different types of races. Aside from the standard race from point A to point B there are also Marked Man races which you need to get from point A to point B while cars will randomly appear and try to run you off the road. The take down races and stunt runs are additions that are very welcome as they are quite different from your standard races. The unique part about all of the race types is that if you have a specific destination, you can take whatever path you see fit. It is not linear in that it forces you to stay on one path, if you think that taking a left at a certain light is a better move then you can do that, there is no set course. 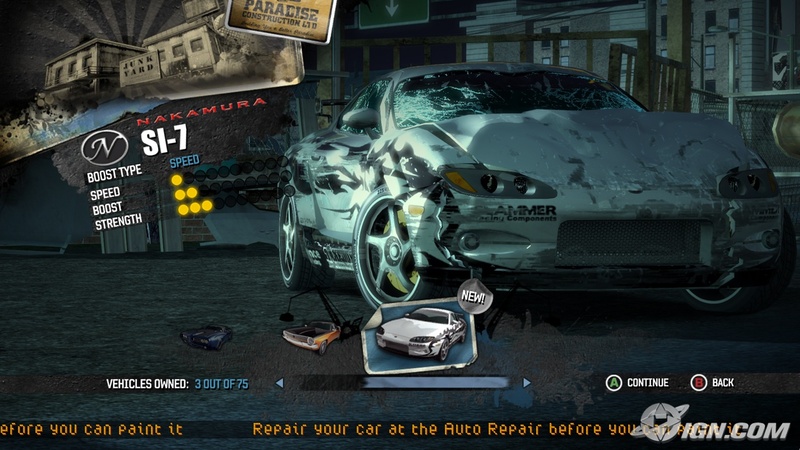 Having not played a racing game in a while, I had a lot of fun playing Burnout Paradise. If you have a chance to pick it up at a cheap price then I would recommend it, it was a lot of fun. Thank you for reading this article as well as our other articles this weekend. We hope you enjoyed this Memorial Day event. Be sure to follow us on Twitter, Facebook and Tumblr. E-mail us with questions or comments or just do so in the comment section below.